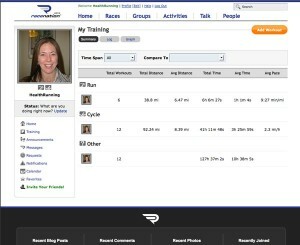 The Summary screen of the RaceNation training log; notice below are the community features for networking, blogging, and sharing photos. It’s been just a little over a month since I decided to start reviewing training logs. I am definitely one who learns by doing and once I discovered the endless options for tracking my training online, I decided that the best way to decide which system worked best for me would be to try them all out. This entry was posted in Articles and tagged cycling, online community, Pilates, RaceNation, review, Running, swimming, Training, training log, Triathlon, work-out management on March 24, 2009 by Natalie.